Click the "Contacts" tab on the main window. The Distribution Lists are shown in a docked area of the Contacts tab. 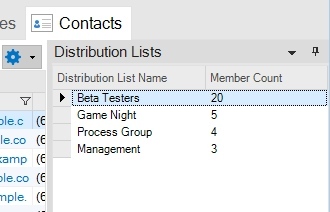 The Distribution Lists area of the Contacts List displays all the defined distribution lists. 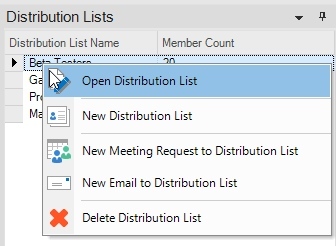 A distribution list can be opened in the Distribution List Editor by double-clicking its row. A distribution list can be right-clicked to initiate sending a new meeting request or email to the members of the distribution list. New distribution lists can also be created and added to this tab. The Distribution Lists area defaults to being docked along the right-edge of the Contacts List. It's possible to unpin the Distribution Lists area so it automatically hides as a tab. Click the "pin" button on the right-side of the Distribution Lists title bar to unpin the list. It's also possible to change the docking to a different edge of the Contacts List. This can be done by clicking and dragging the "Distribution Lists" caption bar. When a distribution list row is right-clicked, a context menu will display. This command will open the select distribution list in the Distribution List Editor, where the distribution list's members can be added or removed. This command will command the Distribution List Editor to be displayed for a new distribution list. This command will create a new meeting request to the selected distribution list(s) and display the meeting request in the Event Editor, where the details of the meeting request can be specified. The meeting request will be sent via email, so this command will only work correctly if your email settings have been configured. This command will initiate a new email message to the selected distribution list(s), using your default email program. This command will delete the selected distribution list(s). If you accidentally delete a distribution list, the Undo command on the Edit Menu can be used to restore the deleted distribution list.